How low can you go? Find out in this crazy, laughter-inducing limbo game. 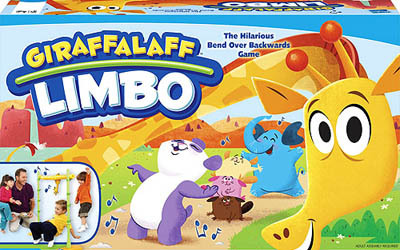 Crouch, duck, scoot and crawl your way under this giraffe as the music plays. The spinner will tell you which technique you must use: classic limbo, crabwalk, crawl, giraffe walk, forward, and backward. This is a limbo party in a box. It is an electronic toy that requires C batteries, so be sure to have some on hand before the gift is opened, because you'll want to play right away.